It was just a couple of weeks ago that the Obama campaign was still trying to spin the Solyndra debacle as a “successful and innovative” venture. A year ago yesterday however, the administration wasn’t quite as poetic when describing the plight of the company. In an e-mail exchange involving Obama aides Dan Pfeiffer, Stephanie Cutter and David Plouffe, discussin of Solyndra’s demise prompted a one word response – “Ugh”. What a symbolic representation of the fall of Obama’s pet solar project. The California solar company, Solyndra, once heralded by the Obama administration as a prime example of how the Recovery Act created new jobs while promoting his vision of renewable energy, closed their doors. 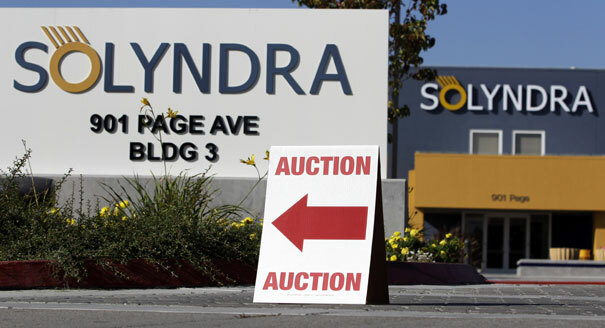 Once a beacon of solar light in the progressive green jobs agenda, Solyndra received a $535 million federal loan with the help of newly minted energy secretary, Steven Chu, only to find themselves staring down bankruptcy and the release of more than 1,100 workers. What say you, Mr. President? Ugh. Doug Ross reports on the “ugh” factor, citing a silver lining to be found in the Solyndra mess. That the company’s executives maintained respect for the taxpayers as they bilked them out of millions of dollars. And that the company remained environmentally conscious. Both of which Ross sarcastically explains – are untrue. Next post Romney Hammers Obama on Unemployment Rate - "America Can Do Better"
Previous post Obama Campaign Suing to Make It Harder For Military Members to Vote?